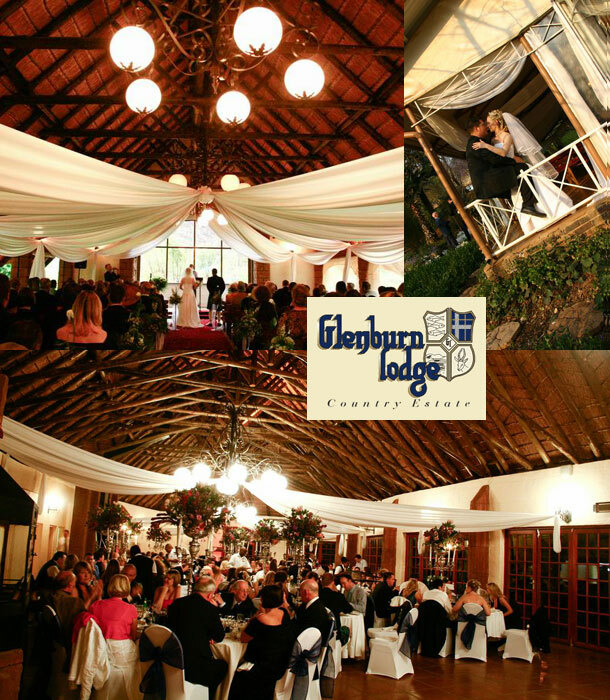 Glenburn Lodge has a number of wedding venues that will suit wedding parties of all sizes. The perfect venue for your wedding, no matter if you are looking for an intimate affair or one that includes all your friends and family. Celebrate your wedding in style at this beautiful riverside setting. With its open-sided gazebo-style chapel, lovely landscaped gardens and thatched reception area, Glencove, seats from 80 – 100 guests, if a dance floor is included. Glenkyle, on the banks of the Blaauwbank River, is our largest wedding venue and accommodates up to 250 guests. 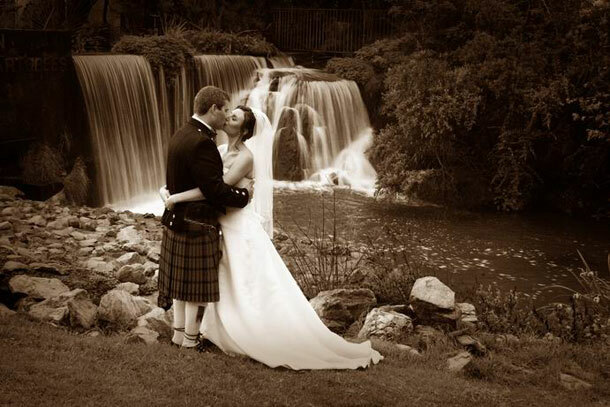 With views over a waterfall and landscaped gardens and water features, it is a favourite with wedding photographers. Glenkyle features an open-sided, thatched Chapel seating up to 250 guests. Glenwillow is the latest addition to our spectacular wedding offerings. Situated in the Bush Willow Tented Camp, this venue accommodate up to 60 guests on the banks of the Blauwbank River, nestling at the foot of the Swartkop Mountain range. Bush Willow Tented Camp offers a fun-filled African alternative for weddings with its Boma, ten tents and heated swimming pool. Each tent accommodates up to six guests and is equipped with a kitchenette, shower and toilet facilities. The whole camp may be booked out for the bridal party at a very competitive rate. Experience the warm and cosy ambience of our Wine Cellar leading off our popular Laird’s Inn Pub. Down the curved stairwell, you will find the distinctively decorated, well-stocked, authentic Wine Cellar. To complement your meal, choose from the impressive selection of Cabernets, Pinotages, Shiraz’s and Merlot blends, and for the wine connoisseur – Vintage Wines! Ideal for cocktail parties, fondues, wine tastings and corporate functions of up to 20 guests. To make your dream wedding come true contact the team at Glenburn Lodge on +27 (0)11 668-1600 or for more information visit Glenburn Lodge Country Estate to send an enquiry.